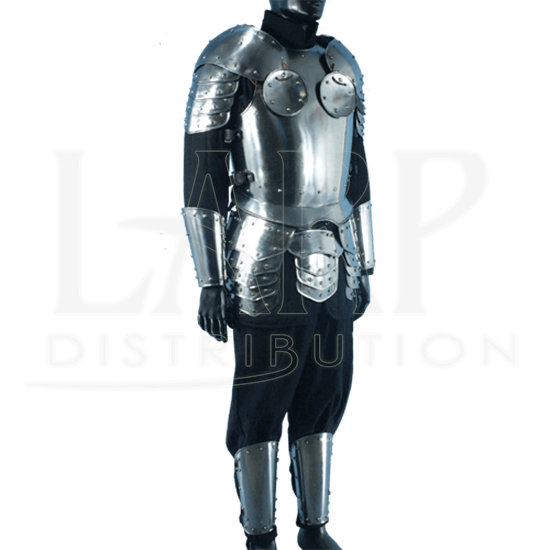 The Warriors Complete Armour Package is a great set of steel armour that includes all the essential pieces needed so you are ready for battle right away. The set includes the warrior steel breastplate, warrior steel backplate, warrior pauldrons, warrior tasset belt, warrior arm bracers, and warrior greaves. The Warrior Armour looks very nice when worn all together, the design is simple with steel studs along the edges of all the armour pieces. A must for any Knight in need of shinning armour! The armour is crafted from 19-gauge steel and includes all leather straps and buckles needed for wearing. We recommend any of our gambesons to be worn under the armour for comfort and ease of movement without any pinching. Great for LARP, Theater, Movies, Costumes and the SCA (check with your local chapter for approval). Care Instructions - Keep away from water. Clean with a metal polish and re-oil occasionally to properly maintain the armour. Use leather-care products for the fittings.